Xinhua News reports that FAO is going to use the new digital tool to fight the fall armyworm in South Sudan. The article further reports that FAO will distribute electronic tablets to 220 villagers to help monitor, track and share the information about the location and spread of the fall armyworm infestations. We reproduce the full article for the e-Agriculture Community, all rights are xinhua news agency. JUBA, Sept. 25 (Xinhua) -- The UN Food and Agriculture Organization (FAO) has introduced a new digital tool to fight the fall armyworm in South Sudan amid massive crop failure caused by the voracious pest. FAO said in a statement released on Tuesday that it will be using an early warning mobile application system to enable farmers to document and share information about the location and severity of fall armyworm infestations. The UN agency will distribute electronic tablets to 220 villagers and crop monitoring committees across the east African country to monitor and transmit information about the spread of the fall armyworm. "The data will be uploaded directly to a server at the FAO headquarters in Rome. A heat map will be automatically generated, making the aggregated analysis immediately available to the community members in South Sudan," said Pierre Vauthier, FAO deputy representative in South Sudan. South Sudan declared an outbreak of the fall armyworm in June 2017, with the agriculture ministry saying at the time that some 166,000 hectares of farmland had already been infested, 500 hectares of which were destroyed completely. The highest level of infestation was recorded in the agricultural hubs of Eastern and Central Equatorial regions. 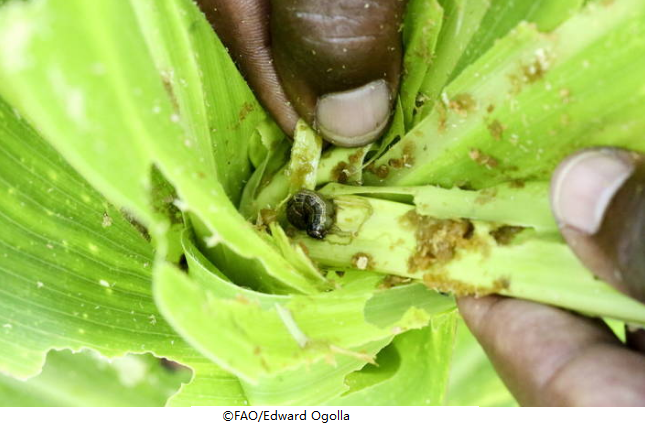 FAO said the fall armyworm can cause extensive crop losses of up to 73 percent depending on existing conditions, and it is difficult to control with a single type of pesticide, especially when it has reached an advanced larval stage. The presence of fall armyworm in the African continent was first reported in Sao Tome and Principe around January 2016, and has devastated farmlands in several countries in southern and eastern Africa.The pest feeds on more than 80 host plants, but prefers maize or sorghum, the major staple crops in South Sudan. FAO said crop failures linked to this pest is likely to have a negative impact on the already precarious food security situation in South Sudan. As part of combined efforts to fight the pest, FAO and South Sudan's Ministry of Agriculture and Food Security have developed a five-year plan for sustainable management and control of the fall armyworm. The blueprint, which is expected to cost some 26 million U.S. dollars, provides guidance to help the country mobilize resources to reduce yield losses from infestation by the fall armyworm.